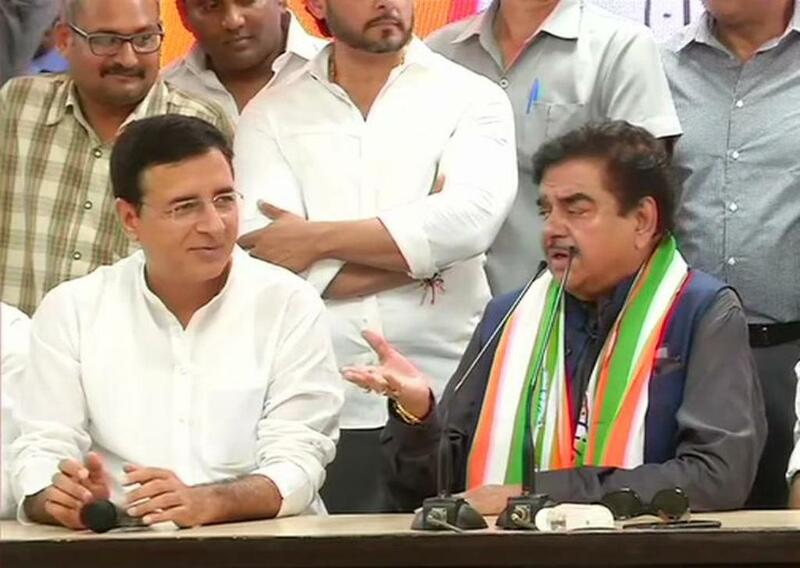 New Delhi: Ending days of speculations, rebel Bharatiya Janata Party (BJP) parliamentarian Shatrughan Sinha finally joined the Congress party on Saturday. Sinha, the sitting MP from Bihar’s Patna Sahib, had been quite vocal against Prime Minister Narendra Modi and party chief Amit Shah despite being in the saffron party. The actor-turned politician joined Congress after he was denied a ticket by the BJP to contest the upcoming Lok Sabha polls. He will Union Minister and BJP leader Ravi Shankar Prasad in Patna Sahib, the LS constituency which he had been winning for the past two terms. He though said he was quitting the BJP with a heavy heart. “It’s with a heavy heart and immense pain that I finally bid adieu to my old party, for reasons best known to all of us, on 6th April, which also happens to be the Sansthapna Diwas of BJP,” Sinha said, while joining the Congress on Saturday. Soon after Joining the Congress, Sinha came out with all praises for his new chief Rahul Gandhi. Admiring Congress’ proposal of NYAY scheme, which will help poor people to achieve minimum income of Rs. 12,000 per month, Sinha said it was an unprecedented proposal for people. “Rahul Gandhi has won three state elections recently. He is a tried, tested and successful leader,” the new Congress leader said about his party chief. Shatrughan Sinha remained the Rajya Sabha MP from Bihar between 1996 and 2008. He served as the Union Cabinet Minister of Health and Family Welfare and Shipping under the BJP-led National Democratic Alliance (NDA) government in the time period of 2002 to 2004. He has been the Lok Sabha MP from Patna Sahib since 2009. Shatrughan Sinha’s actress daughter Sonakshi has fully supported her father’s decision to switch party. “I think it was the time for him to move on. I think he has done it a bit too late. He should have done it long back,” Sonakshi had said.